Hi everyone, in case you are not aware of Den’s story I thought I would cover it again and an update from his 6 month review with the Diabetic nurse at the Doctors surgery. This is such a powerful message and I do urge you to pass this on to anyone especially diabetics. “I am insulin dependent and also have had two heart attacks. 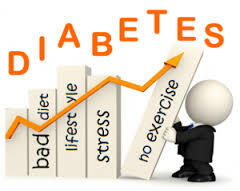 My diabetes wasn’t controlling hence I was under the care of the Diabetic Specialist at our local hospital. In December this year I had a cancerous tumour removed from the right side of my mouth. The whole of the palette, jaw and teeth were removed. For two days I was in Intensive Care followed by 12 days in High Dependency where I was fed through the nose as I had a plate screwed into the top of my mouth. Whilst I was in hospital they couldn’t control my sugar levels and the ward were in daily contact with my Diabetic specialist. Dr Rex Johnson and his wife Jeannie visited me in hospital and left a tube of Sizzling Minerals. I couldn’t take them at the time as I was being fed through the nose. For all of those who know me well, you will know that I am a bit of a sceptic when it comes to supplements. But I was willing to give them a go. In the following weeks, at my regular cancer check ups with the hospital, the Professor was amazed at my healing and for those who know, diabetics take longer than normal to heal when they have an injury. I was given the all clear with no radio and no chemo. At my 3 month Diabetic review with the specialist in March 2014 she was astounded at my results, especially as my sugars were out of control in the hospital. She was so amazed with blood, diabetic and weight results that she discharged me from her clinic at the hospital and referred me back to my doctor for 6 monthly checks. The specialist asked me what I was doing different and at this stage I did not admit to taking the Sizzling Minerals. Her words were “whatever you are doing just keep doing it”. This week I went along to see the Diabetic Nurse at my doctors not expecting any further changes. The Nurse was ecstatic. She was over the moon with my results and this time I wrote down exactly what they were. HBA1C – now this is the biggest indicator for diabetics as to what is going on inside. It shows you how much sugar is sticking to your blood cells. Well I have been as high as 122. In March it had dropped to 60 and now it’s 58. The optimum is 48 so I am nearly there. My kidneys are normal. My liver is normal. My cholesterol is 4.8. The Nurse would like it at 4 however that is going the right way and I am well pleased at 4.8. I have lost another 6kg. The blood cell clumping photo in the Sizzling Mineral brochure now makes sense to me when I relate it to my HBA1C results. It’s not only about visual and physical improvements that people are seeing with this product, it’s what is going on inside. So I urge everyone out there to start taking these fantastic minerals to keep your insides healthy. As they say, prevention is better than cure. Please pass this on to anyone you can help. So Diabetes – Den’s Story may help someone you know?